International attention will be focused on Northern Ireland this week examining the rights of Travellers and Roma. The first joint meeting of the COE-FRA-ENNHRI-EQUINET Operational Platform for Roma Equality (“the OPRE Platform”) and the Collaborative Platform on Social and Economic Rights (“4SocialRights”) will take place in Belfast. The event comes after the publication of the Human Rights Commission’s report into Travellers’ accommodation in March this year. The investigation identified a range of systematic issues including inadequacy of sites and racial discrimination towards Travellers in Northern Ireland. “It is great to have the Council of Europe and the two Platforms on Roma rights and on social and economic rights represented in Northern Ireland on this important issue. This event takes place as UK withdrawal from the EU creates wider uncertainty for human rights protections within Northern Ireland. This Commission continues to call on the UK Government to make a legal commitment to retain the Charter of Fundamental Rights, to fully respect the rights under the European Social Charter of the Council of Europe, and moreover to accept the revised European Social Charter and to ensure that no diminution of rights is caused by the departure from the EU. 1. The first joint meeting of the CoE-FRA-ENNHRI-EQUINET Operational Platform for Roma Equality and the Collaborative Platform on Social and Economic Rights will take place at the Titanic Hotel Titanic Quarter, 8 Queens Road, Belfast on 15 May. 2. The 5th meeting of the CoE-FRA-ENNHRI-EQUINET Operational Platform for Roma Equality (“the OPRE Platform”) will take place at the Titanic Hotel, Titanic Quarter, 8 Queens Road, Belfast on 16 May. 3. The 6th meeting of the CoE-FRA-ENNHRI-EQUINET Collaborative Platform on Social and Economic Rights (“4SocialRights”) will take place at the Titanic Hotel, Titanic Quarter, 8 Queens Road, Belfast on 16 May. 4. OPRE is a joint initiative of the Council of Europe, the European Union Agency for Fundamental Rights (‘FRA’), the European Network of Equality Bodies (‘Equinet’), and ENNHRI to which the European Commission, the EU Ombudsman Office, the OSCE/ODIHR Contact Point for Roma and Sinti Issues, and the OHCHR participate as Associated Partners. 5. The Commission’s ‘Out of Sight, Out of Mind’: Travellers’ Accommodation in Northern Ireland report was launched in Belfast City Hall on Tuesday 6 March 2018. 7. Since publication, the Commission has embarked on an implementation strategy engaging with relevant public authorities, Travellers and Traveller support groups on the reports recommendations and findings. 9. 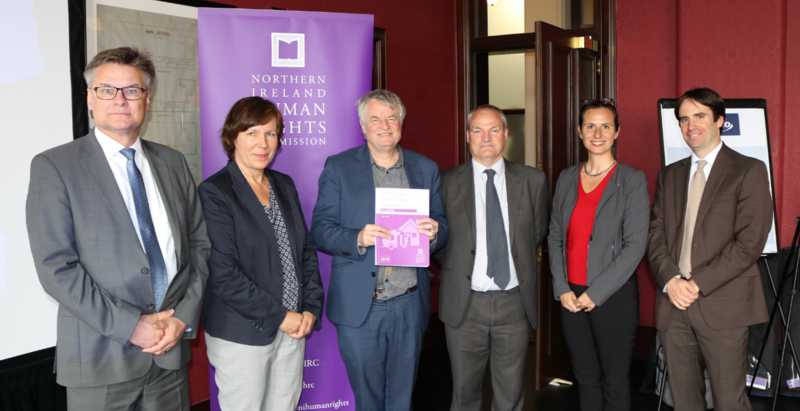 Read the Northern Ireland Human Rights Commission and the Irish Human Rights Commission (the Joint Committees) statement on the UK withdrawal from the European Union here. The Joint Committee calls for the text of the Withdrawal Agreement to commit the UK to retaining in UK law the Charter of Fundamental Rights of the EU and to enable the UK to keep pace with its evolving protections over time. The Joint Committee recommends that the Withdrawal Agreement include a clear and enforceable commitment to no diminution of human rights and equality standards following withdrawal (rather than simply as a result of withdrawal). In order to protect further the 1998 Agreement and its institutions, the Joint Committee calls on the EU to seek a commitment that the UK will ensure that all forthcoming Brexit-related legislation affecting Northern Ireland will be fully consistent with the 1998 Agreement. 10. The Northern Ireland Human Rights Commission is an independent statutory body first proposed in the Belfast (Good Friday) Agreement (1998) and established in 1999 by the Northern Ireland Act (1998). It is answerable to Parliament at Westminster.